The Bay of Islands is a rare destination; an accessible escape. Blissful beaches, forgotten coves and timeless towns, The Bay of Islands is an adventurer’s paradise. The region has become known as a coastal paradise, where conditions for could not be more appealing for sailing, deep sea fishing and a whole host of other water sports. But the real attraction is the scenery. A stunning coastline with a dizzying number of deserted islands to explore, set against a green, rolling landscape inland, the Bay of Islands is the ideal place to simply get lost. Just 3 hours from Auckland, the Bay of Islands is a weekend adventurer’s paradise. The bay itself, named after the 144 islands that litter the bay, is the perfect place to set out to sea and get away from it all. There are countless island beaches off which to throw anchor, swim ashore and spend a blissful afternoon in the sun, with the sand between your toes on your very own private beach. Whether you decide to captain your own yacht, speed boat or kayak, the best way to explore the Bay of Islands is from the sea. If you are not a confident captain, there are plenty of options to let someone else take the responsibility! Leaving from the Bay of Islands’ coastal towns (especially Paihia) are a variety of cruises, chartered boats, day cruises and guided tours, which ensure that you see the most popular spots off the coast, including the Hole in the Rock, and find the area’s most popular inhabitants; dolphins. The Bay of Islands is also known for its deep sea game fishing. 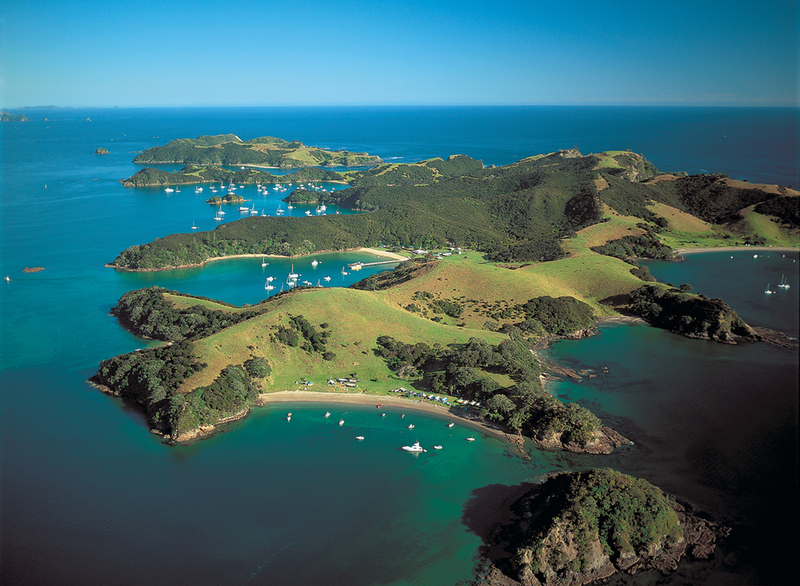 Known as the Marlin Capital of New Zealand, the Bay of Islands is a fantastic place to fish. In the bay itself are some great spots, but further out to sea are the best of the deep sea fishing areas, best found using the specialist knowledge of a local captain. The same can be said for scuba diving and snorkelling. Although a wonderful window into the world aquatic can be found simply be putting on a snorkel and mask, the best places are well known secrets, which an organised tour guide will be able to work into your itinerary with ease. Dotted about the coastline of the Bay of Islands are a handful of essential stopping points. The Kauri Forests of Puketi and Tutukaka offer a beautiful, spiritual place to walk, where natural beauty and legend abound. There are a great range of marked walks to take through the forest, many leading to the astonishing Tane Moana, the largest kauri tree on the east coast of New Zealand. The Bay of Islands is also home to Waitangi, the historic site known as the Birthplace of the Nation, lively Paihia, where you can organise any activity and revel in the evening fun, and a handful of timeless little towns including Russell, Opua and Kerikeri. There is a vast amount to see and to do in the Bay of Islands, but with so many glorious beaches, fine restaurants and local vineyards, the Bay of Islands is the perfect spot on which to sit back and do very little!